If a person says they have done everything in Cairo you can be assured that they are lying. This is a city that has much to see and do. Visitors will split their time visiting world class archeological sites and wandering the twisting labyrinth of streets that comprise this city. People wandering the streets of Cairo are treated to a feeling of antiquity as sections of town recreate a feeling of what life may have been like in ancient times. There is much intrigue to be found in this always changing city. 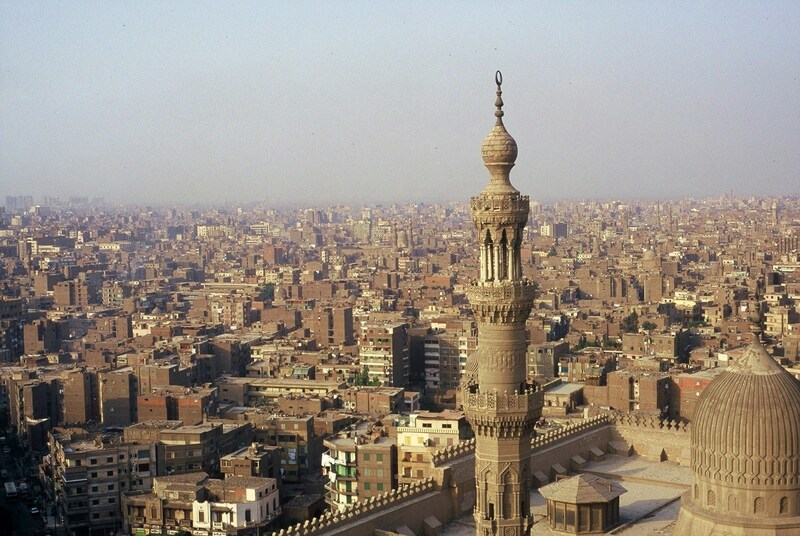 A few more things to see and do in Cairo include. Situated in the eastern neighborhoods of Cairo Islamic Cairo is comprised of a maze of twisting alleyways and streets that often find their way to awe-inspiring architecture. Coming to this section of the city gives visitors a chance to really soak in some of the city’s authentic culture… with the noise, the crowded streets and even the random and abundant animal droppings all on full display. Many visitors to the city have gone as far as to say that if you didn’t visit Islamic Cairo you didn’t visit Cairo at all. 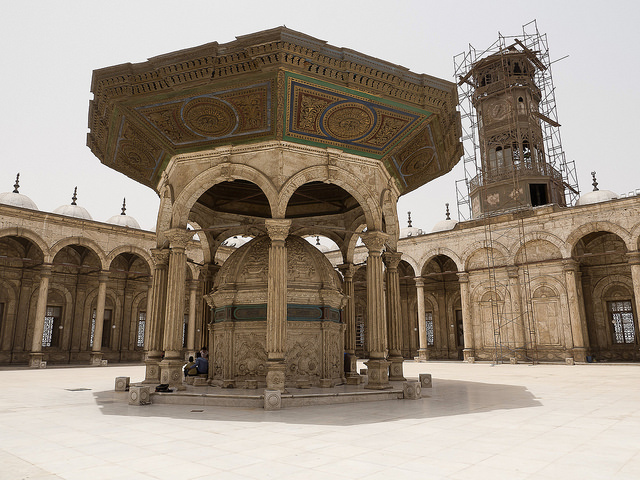 Some of the top attractions in this part of the city include the Salah El-Din Citadel, the Mohamed Ali Mosque, the Mosque of Ibn Tulun and Khan el-Khalili bazaar. What is recommended is just to wander this district by foot and happen across these great buildings amongst the areas noted chaos. To get here take the metro and get off at Naguib stop. The most popular single attraction in Cairo, and Egypt for that matter, are the Giza Pyramids. One of the Seven Wonders of the Ancient World the Pyramids have remarkable remained intact for approximately 4,500 years. 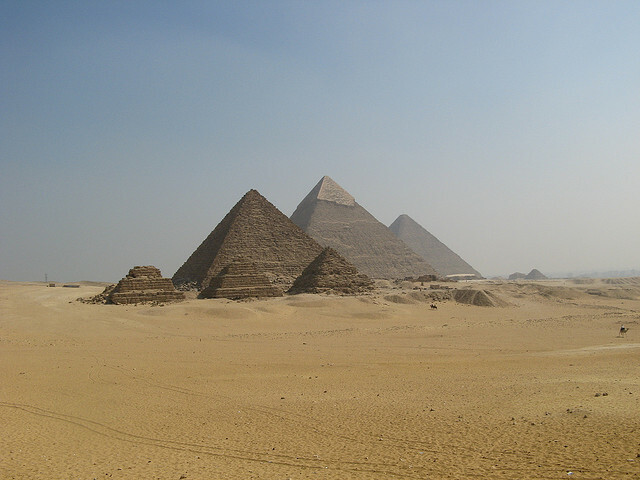 There are three pyramids with the largest being the Great Pyramid of Cheops which was the burial place of the Fourth Dynasty pharaoh Khufu who ruled between 2589 and 2566 B.C. Keeping things in the family, Pyramid Chephren houses the son of Khufu – and the next ruler of what is now Egypt – Khafra. The final pyramid, the smallest of the three, is the Pyramid of Mycerinus which was erected by the successor of Khafra -Menkaure. Standing vigil near to all three pyramids atop of the Giza Plateau is the Sphinx. 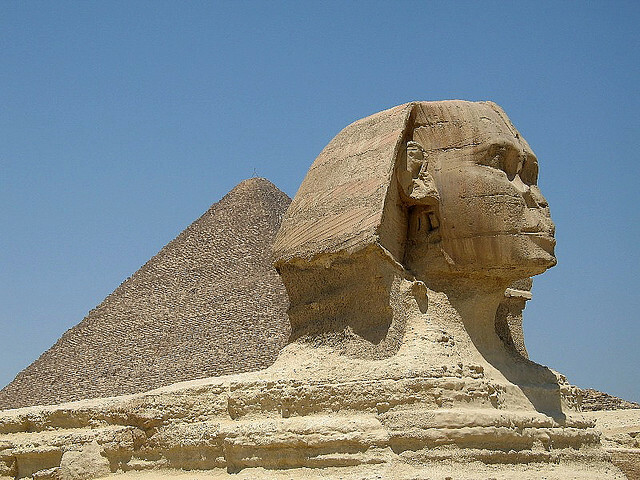 The Sphinx is a massive iconic statue that combines the head of a man with the body of a lion. Admission to the Pyramids costs around $10 US dollars for general admission. There are options to purchase tours through the tunnel of the pyramids sold separately. Image by Edgardo W. Olivera, dungodung,Aeropixels Photography Under Creative Common License.